In the middle of the mountains, among the tempting nature there is an ancient land with a beautiful name – Artsakh. Armenia and Artsakh are connected with sacred invisible threads. A tour to Armenia is impossible without combining it with Artsakh. 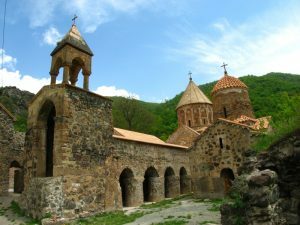 The Dadivank monastery of Artsakh is situated at an altitude of 1100 meters. The scenic place is shrouded in the mystery of tranquility and with such indescribable soul capture colors. It seems that everything here is geniously painted by the brush of an artist: the arch, the stone itself, from which the monastery is built, domes, a synthesis of shadows, and even reliefs. Hospitable people, who surround you everywhere, always rushing to treat with something delicious and unusual, tell about the beauty of their land and simply share their impressions . 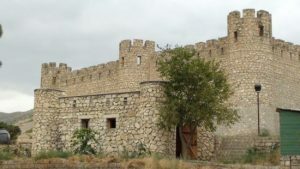 The fortress of Shushi, which is called Shushiberd, is known since the eighteenth century. There is a legend that Prince Smbatyan won a victory over the Arab army. Surb Amenaprkich – Cathedral of St. Christ the Savior is the main temple of the Armenian Apostolic Church in Shushi. The colour and shape of the structure make the church unique in its kind. Being located on a plateau, the church draws attention from everywhere. The Canyon of Unnot is like an abyss of time. It is worth standing at the slope and think about the purpose of our existence! It would not work another way around: nature has frozen in time, surrendered to the secret of the universe. In a warm season, you can swim in the river. You feel pleasure even from the fact, that you have discovered such a place on the planet, and that place is located in Artsakh. Be sure to visit the Monastery of Amaras. 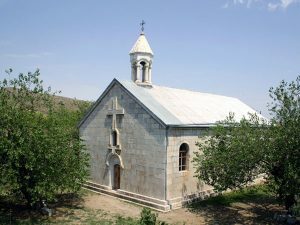 The destination is remarkable because it served as a shelter for St. Mesrop Mashtots, who created the Armenian alphabet and laid the foundation of the Armenian school in Artsakh at Amaras. Interesting to know that the oldest plane tree in the former Soviet Union Tnjri is here. It is so impressive! The tree is huge and attracts your attention. And the monument “We Are Our Mountains” is known far beyond the borders of the country. It is even a symbol of Artsakh. Strict faces of the couple, also known as “Tatik-Papik” or “Grandma and Grandpa, emerging far into the horizon determines the character of the whole country and its inhabitants. 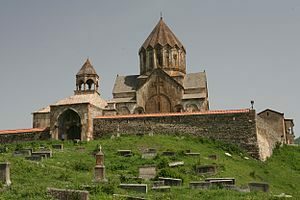 Gandzasar monastery, the name meaning “hill of treasures” in Armenian. It differs in its construction and color of the stone: a unique monument of medieval architecture. The interior and exterior decoration is simple in style. Jermajur or “warm water” – a place rich with natural hotsprings, healing mineral waters. There is a swimming place, where you can relax among this indescribable beauty. And if for a second you remember that you are at an altitude of 2200 meters above sea level, you can forget everything and think that you, perhaps, are in some kind of a paradise. 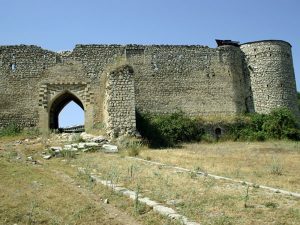 Artsakh Tigranakert city with majestic steps tells of the great events that took place here. You feel a living witness of history and you feel the importance of the fact that you are a part of a huge universe. 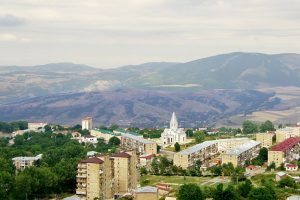 The capital of Artsakh, the city of Stepanakert, is a cozy city nestled in the mountains. Surrounded with fabulous nature it guarantees a complete rest and inspires confidence in tomorrow. 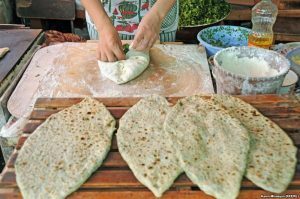 And, of course, you can’t visit Artsakh and not to try jengyalov hac… It is a national bread made from herbs. Be sure to taste it and you will remember it for a long time. Perhaps, it will remind you of a wonderful country situated among gorgeous high mountains – about Artsakh.